Free Shipping Included! Aquaphoric Herb Garden Tub - Self Watering Passive Hydroponic Planter + Fiber Soil, Keeps Indoor Kitchen Herbs Fresh and Growing for Weeks on Your Home Windowsill. Compact, Attractive and Foolproof. by Window Garden at Tulips Orchids. MPN: Tub01white. Hurry! Limited time offer. Offer valid only while supplies last. Buying fresh herbs from the supermarket seems like a great idea, so you buy them, plant them and unfortunately in few days they die, not so great! Buying fresh herbs from the supermarket seems like a great idea, so you buy them, plant them and unfortunately in few days they die, not so great! That's because there're originally grown hydroponically and then you try to grow them in a conventional planter and soil, which causes the roots to rot. Our Aquaphoric planters provide vital root zone oxygen needed for your herbs to survive for weeks instead of a few days. ROOTS BREATH, PLANT FLOURISH - Conventional potting soil will eventually compact and get waterlogged, our Fiber Soil will draw up the perfect balance of water and oxygen from the built in Aquifer. The natural fibers are like microscopic tubes allowing water to pass through while providing vital oxygen to plant roots. The increased oxygen means less over watering, the #1 reason for plant failure. Fiber Soil has minimal nutrients, for best results add fertilizer to feed your plants. IT'S FOOLPROOF - Conventional planters must be watered precisely when needed, requiring constant checking for proper plant moisture, rarely accurate even with experience. Watering is so easy and precise with the Aquaphoric planter, just check the water gauge to see if water is needed. No more soggy roots or wilted plants from over or under watering! 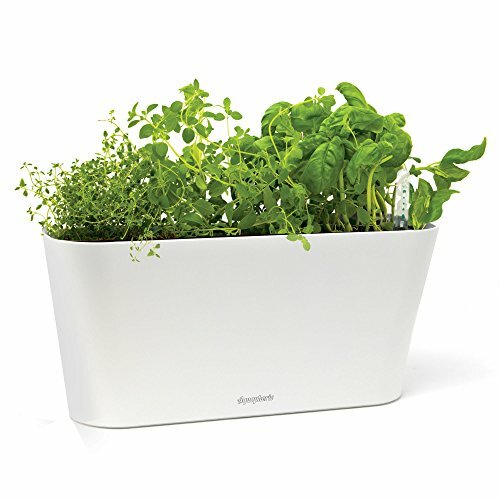 FRESH HERBS - Growing fresh herbs in your kitchen with the Aquaphoric Tub Planter adds elegance and convenience to your healthy life. GREAT GIFT - Looking for just the right gift? How about giving the gift that keeps on giving. Now it's easy to enjoy the power of plants with Aquaphoric planters, there're foolproof and look great! ***CHECK OUT OUR STORE! - Click on the blue Window Garden link at top of page*** FRESH HERBS - Grocery store herbs only last a few days in a conventional planter. Now you can enjoy fresh herbs on your windowsill or counter top when you need them, they'll last for weeks in the Aquaphoric Herb Planter Tub. Herbs are not included in this listing but they're easy to get, most grocery stores sell them. PLANTS LIVE LONGER - The unique passive hydroponic action creates the perfect balance of root zone water and oxygen, allowing plants to grow healthier and flourish. FOOLPROOF - It's self-watering! The handy water level indicator let's you know when and how much to water you're indoor herbs and house plants. Watering is reduced to weeks instead of days. Aquaphoric Planters work great for all plant types, flowers, herbs vegetables, tropical foliage, succulents and seed starting. ROOTS BREATH, PLANTS FLOURISH - Includes 6 quarts of Fiber Soil. Superior growing medium because roots breath better so plants thrive. Fiber Soil contains minimal nutrients, you'll need some fertilizer to keep your herb garden growing lush and vibrant. GREAT GARDENING GIFT - Houseplants and especially herbs are good for you, plus they look great. Why not give the power of plants to someone you care about? It's easy to grow plants with an Aquaphoric planter. Anyone can do it.